I refer to my thirteen year old affectionately as the Leprechaun. It's a name based more on her Irish impish disposition than her luck. In fact, she's been anything but lucky lately as her head has become a magnet for impact damage. It seems that if there is anything around her that is capable of konking her on the noggin, not only will she be in its path, but it will fail to miss. The downside is that since she got her first concussion when walking into the Beast's chair on stage as Belle last month, she has not healed. Headaches and occasional blackouts have kept us worried. So there we were in the night time pediatrics unit awaiting her prognosis. There was the waiting and the waiting and the CT scan and the waiting and the waiting. During all this time I played with my iPhone while she texted on hers. Then our phones died and we were forced to talk to each other. All in all, not a bad Daddy/daughter date. She appreciated me helping her out even though it wasn't my week with the kids, and I appreciated being with her. Then I discovered I had lost my iPad. Apple's Find My iPhone doesn't work very well on WiFi only iPads. There's that funny little hitch where the iPad needs to be actually connected to the internet to report its location. I had no idea where I had put it down. In the waiting room? In the patient room? At the CT scan area? At any number of places I visited with my girls earlier? On top of my car? I know it is two years old, but $599 is $599 and I was starting to panic. We revisited the offices and pestered the nurses. We called the Leprechaun's mother. I tweeted my distress. And then I began blaming myself. I am constantly losing things. Important things. Most of the time I get lucky, like that time I left my Boredom Survival Kit™ in a parking lot at a school and refound it hours later all alone in the dark. Somebody had rifled through it, probably looking for ID, but had left my MacBook and other expensive items unharmed. This time I was certain I was not going to be so lucky. People with ADHD are used to making mistakes. All we need is ONE errant thought at the wrong time and we can walk away from important items or forget about important events. I have lost friends over this wonderful ability to get distracted so completely. I even have family that thinks very little of me. Normal people just can't believe that anybody could be as forgetful as we are. We must be doing it on purpose. Yeah, I lost my iPad somewhere on purpose. Right. This is why I have so many routines that I follow. I feel like an old man with all the patting and muttering I do as I go over my list before leaving any room. Do I have my wallet? Keys? What? Where? Oh, there they are. Why are they in that pocket? There. That's better. Now where is that book/bag/item/whatever? Obviously, I had failed to go through my routine at some point and left my iPad on a chair or shelf or stack of magazines &c. Now somebody has found it, wiped it, and is using it carefree, the dirty scumbags. No! I'm the scumbag! How am I going to afford another one right now? Idiot! Where did I put it? I can't be trusted with anything. Stupid! Stupid! Stupid! "Here it is!" the Leprechaun chirped cheerfully. It seemed that the Goblin, my ten year old, had taken it out of my bag without permission earlier and used it in the back of the minivan. Out of sight, out of mind. And what of all that blame? It's been a while since I laid into myself so severely. In fact, stopping that destructive thinking process was one of the first things I forced myself to do years ago before I even began this blog. I couldn't learn to like myself if I was beating myself up all the time. There I was. Blaming myself for something that wasn't even my fault. 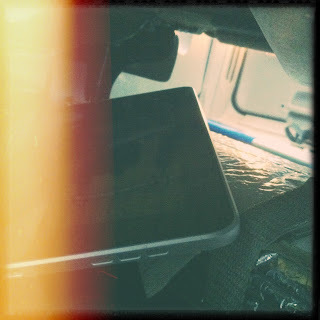 Insulting myself secretly while the silly iPad was behind me under a seat in my own minivan. Nevermind that panic doesn't help any situation, pointless blame doesn't help the situation either. I've relearned my lesson. And if you have a problem overly blaming yourself, you would do yourself an immense favor by training yourself to not do that anymore. Not everything is your fault. Besides, sometimes some of these moments can be funny. My children still laugh about that poor box of donuts I put on top of the minivan over ten years ago and forgot to bring in. I didn't remember about them until something slid off the roof down the road. They were a little worse for wear, but still edible. So keep your cool and lay off the self-blame. Whatever you lost may be just behind you on the floor. Follow me on Twitter as @SplinteredMind. I also explore iPhone photography with Instagram as douglascootey (peek). And if you're a glutton for punishment you can friend me on Facebook as well, or find me on Path where I more openly discuss my coping strategies and feelings.